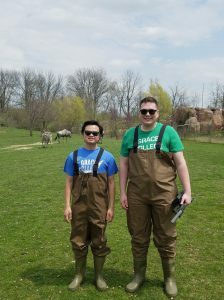 Grace College students Joey Gibson (left) and Jacob Mishne (right) in the African Journey biome in the Fort Wayne Children’s Zoo where they conduct water testing. Lions, hyenas, wildebeests, and 22 other animal species make their home in Indiana’s Fort Wayne Children Zoo’s African Journey biome. Zoo guests may have noticed the biome hosting another type of visitor over the past few years: students from Grace College, Winona Lake, Ind. Led by Dr. Chad Snyder, chair of the Department of Science and Mathematics and director of chemical research at Grace, teams of students have ventured into the African Journey pond system since 2016 testing for a variety of indicators of pond health: dissolved oxygen, pH levels, nitrite, phosphate concentration, water temperature and algae analysis. The Grace-Zoo partnership began when Snyder was visiting the zoo with his family and noticed several of the ponds had a good deal of noticeable algae. Snyder contacted the zoo to offer to monitor water quality. He does not charge for his services, as he sees the great value in the opportunity for students to research in a real-world setting. With the approval of Dr. Joe Smith, director of animal programs at the Fort Wayne Children’s Zoo, and the zoo’s Research and Conservation Committee, Snyder and one student began the first season of testing in 2016. “We have the privilege of testing behind the biome’s enclosures,” Snyder said. “Each year, we endeavor to demonstrate character and competence to make good on the trust they have placed in us.” Now in their third year of partnership, five Grace students have participated in the research and conducted water tests in all six of the African Journey’s ponds. A health science major with an emphasis in pre-veterinary medicine, sophomore Jacob Mishne thought the zoo research project would be a perfect fit for his applied learning. “Because I want to become a vet, I really enjoy the connection in this project between chemistry – through water testing – and biology – the effect the water has on the biome’s animals,” Mishne said. May 2018 Grace College biology graduate Brileigh Malott felt the opportunity to work onsite at a zoo was irreplaceable. “I got to walk in the enclosures with the animals and wave to families as they passed by. Children asked questions while we sampled and their faces lit up as we explained what we were doing,” said Malott. Testing days begin at Grace College, where Snyder and the students load a vehicle with testing equipment and waders and then drive to Fort Wayne. They meet a zookeeper at the biome and enter the pond system to get samples. After samples are gathered, students test them on-site for temperature, dissolved oxygen, and chemical concentrations and then send them to a lab for algae tests. When all data is compiled, the students analyze it and let Dr. Smith know if anything is out of the ordinary. During their most recent visit in early May, students noticed that the water temperature was already warm in several of the ponds and the dissolved oxygen content was normal. These conditions increase the likelihood of an algae bloom. Algae is a necessary part of the ecosystem, but too much can make aquatic life, birds, and even mammals sick. They informed zoo officials of their findings and recommended installing additional bubblers to agitate the water. Algae does not grow in moving water, and the data the students collected showed the optimal placement for the maximum impact for the bubblers. The zoo has been receptive to their recommendation. Moseti also received great personal reward from his work at the zoo. “As a Christian and an African, I found joy in helping to create a better, safer environment for the animals in the African Journey biome,” he said. Malott reflected that she applied her course studies in a variety of classes to the zoo project. “I used my knowledge of microorganisms from animal biology, understanding of the nutrients in a pond system from aquatic ecology, and information on water composition from chemistry courses. I loved having the opportunity to apply what I had learned in all of these courses to the research we conducted at the zoo,” she said. For more information about Department of Science and Mathematics at Grace College, visit grace.edu/department-science-mathematics/ or call Dr. Snyder at 574-372-5100, ext. 6443.